On Fridays trading session price opened lower though the trading sentiment on Fridays trading session is positive price maintained to close below thursdays pullback low reference. Value formed lower to overlapping and trading sentiment turned to negative despite one timeframing higher for 5 consecutive trading sessions on Daily timeframe. -monthly charts are still in a uptrend and one timeframing for 7 consecutive months and current month so far an inside bar. -Daily charts are in short term uptrend but price facing multiple rejections, almost 9 times price rejection around 9695-9715 zone. 1)Back to Back Poor Highs indicates a possible short term inventory moved to long to too long which increases the risk of holding overnight long positions despite the higher odds of testing those poor high references. Those poor highs are the signs that market players are exhausted and the weak momentum players are getting very little benefits in every uptrending rallies. Fridays sessions is totally dominated by weaker momentum buyers. 2)Fake outs around 9700 zone could be one possibility where multiple price rejection came. Price looking above 9700 and fail is the one bearish scenario but less preferred in the current market setup. 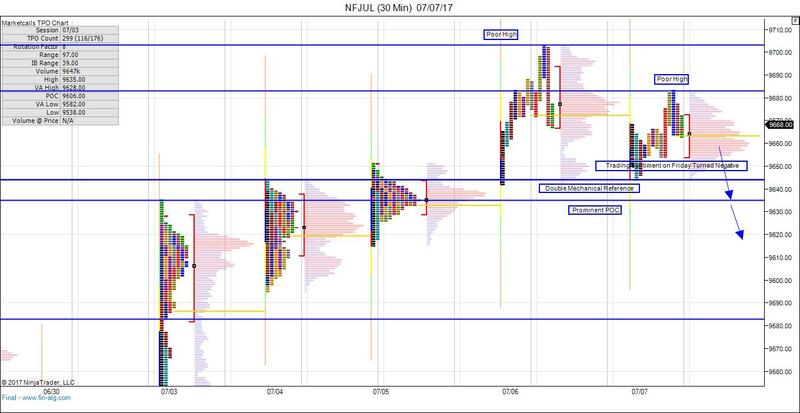 4)Sideways/ Compressed markets on the weekly timeframe is expected to continue for some more weeks and that keeps the market tighter in 9450 – 9700 range. Very good analysis of nifty futures. IMO nifty will move sideways in this whole week.